Cornwall is located in the far south west of England on a peninsula that stretches into the vast Atlantic Ocean, with a dramatic coastline of almost 300 miles it is almost completely surrounded by the sea. The county is split into three sections North Cornwall, South East Cornwall and West Cornwall. Cornwall has many leafy estuaries, captivating fishing harbours and villages, spectacular beaches, and an abundance of exotic gardens and beautiful meadows that flourish in Cornwall’s mild climate. Cornwall is also home to the captivating wilderness of the Bodmin Moor with fascinating prehistoric remains, fantastic walking trails from gentle strolls to challenging hikes, many castles, intriguing towns and villages and holds many local legends. At the beginning of the 19th century Cornish mines were some of the largest anywhere in Europe and the copper industry, centred in West Cornwall, grew beyond any other sector in the British economy. In the old industrial heartland, the landscape has been awarded World Heritage Site Status and is dotted with remnants of its mining past illustrating Cornwall’s enormous contribution to the Industrial Revolution with engine houses, museums and miles of recreational trails. Cornwall’s maritime legacy is never far away where local fishermen land their daily catch of fresh seafood and where tall ships, lugers and ketches unfold their sails in the Cornish breeze. Cornwall has long been one of the most popular UK holiday destinations and is a truly wonderful and beautiful county. Its natural environment is recognised nationally as the Cornwall Area of Outstanding Natural Beauty which can be enjoyed by everyone and can be accessed by the South West Coast Path. The flourishing tourist industry provides a host of accommodation options such as holiday cottages, camp sites, caravan parks, hotels, bed & breakfast and guest houses. South Cornwall is much calmer than the exposed north coast with family friendly beaches, picturesque fishing villages, rolling green hills and lush river valleys in a landscape steeped in history. The main towns and villages of this area are Callington, Charlestown, Fowey, Liskeard, Looe, Lostwithiel, Mevagissey, Poloerro, Saltash, St Austell, St Germans, Stoke Climsland and Torpoint. They all have something different to offer for visitors of all ages from fishing harbours to riversides, old streets to antique shops and lazy beaches to vigorous walks and much more. There are also many hidden treasures from quaint hamlets to solitary coves waiting to be explored. The Roseland Peninsula, located on the south coast, is a district of west Cornwall with the River Fal on its west side and the English Channel on its east side. It is only a small peninsula approximately 10 miles long from St Anthony’s Head to Tregony the “Gate of the Roseland” and about 3 miles wide from the King Harry Ferry to Veryan Bay. The Roseland Peninsula is a great place to visit and it is also the place to get away from the hectic pace of city life. The peninsula has some beautiful little bays and many footpaths for you to explore and walk and because of its Mediterranean climate the peninsula is home to a massive variety of flora and fauna, butterflies, insects and wildlife. So keep your eyes open. There are lots of boatyards, anchorages and sailing clubs so if you would rather get on the water you can easily rent a sailing boat or engage in the many water sport activities such as wind surfing, water skiing or kayaking. The River Fal rising on Goss Moor, which is both a National Nature Reserve and part of a SSSI, between Truro and Bodmin flows into the English Channel at Falmouth. Tributaries of the River Fal include the River Truro, River Kennal, River Penryn and River Carnon. Several tidal creeks also flow into the river. Five Sites of Special Scientific Interest have been designated along the River Fal. The river flows through the Carrick Roads, a large ria that creates a natural harbour and is navigable between Falmouth and Truro. The Fal estuary, where the two river valleys meet the ocean, culminates in an impressive deep-water harbour that has long offered sailors much needed shelter from the prevailing westerly winds. Falmouth Bay is the third largest natural deep water harbour in the world. The Percuil River is a charming unspoilt and navigable tributary of the River Fal and in 2008 the river was the site of the biggest ever mass stranding of dolphins. Twenty one animals died after entering the shallow waters of the river for unknown reasons. St Mawes is a small unspoilt fishing town situated at the southern end of the Roseland Peninsula overlooking Falmouth Bay. It was once a busy fishing port but the trade declined during the 20th century and today with many of the properties in St Mawes being holiday accommodation or second homes it is very popular tourist destination. The town houses two banks, a post office, a chemist, a bakery, a convenience store, a fresh fish stall and a number of gift shops, galleries, cafes, pubs and restaurants. St Mawes lies within the Cornwall Area of Outstanding Natural Beauty and is ideal for a stress free and relaxing holiday amid a mixture of palm trees and pines. The town has two beaches which are ideal for swimming, sunbathing, building sand castles and rock pool fishing and the harbour is great for crab fishing and sailing boats. Moorings can be hired through the St Mawes harbourmaster. There is also a regular passenger ferry service running between St Mawes and Falmouth as well as a twelve seat passenger ferry between St Mawes and Place. The Agatha Christie film “Murder Ahoy” was filmed here as was the 1964 film “Crooks in Cloisters. An episode of Hornblower was also filmed here. St Mawes has also been visited by members of the Royal Family including the HM The Queen, the Queen Mother, Princess Margaret and the Duke and Duchess of Cornwall. St Mawes Castle and its larger sister castle, Pendennis, were built as part of a defensive chain of fortresses by Henry VIII to protect the south coast of Cornwall. St Mawes Castle was built between 1540 and 1545 on the eastern side of the River Fal estuary to provide protection to the large inland expanse of water known as Carrick Roads. It is now owned by English Heritage. Pendennis Castle, opposite St Mawes Castle on the other side of Falmouth Bay, built at about the same time has a more defensive and desirable position and became the main fort of the area. St Just in Roseland is a small village situated two miles north of St Mawes also lies within the Cornwall Area of Outstanding Natural Beauty. St Just is famous for its 13th century church set in riverside gardens planted with semitropical shrubs and trees, many of which are rare in England. 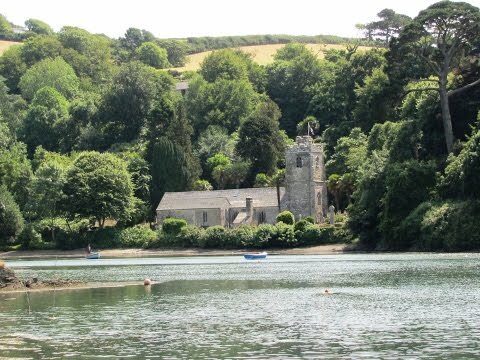 The church sits on the edge of a tidal creek beside the Carrick Roads on the Fal Estuary just outside the village and the views from the church and across the creek are wonderful. There is also an early 19th century Methodist church which is Grade II listed. The village has no shops or pubs. We turn right out of the harbour car park and head forwards following the harbour on our left. At St Mawes Castle we turn right and take the track that follows the River Fal. The track becomes a path and we continue through the fields going through the gates and over the stiles until a small road at St Just in Roseland. Here we bear left on a permissive path and walk to the end to view St Just Creek we then turn back and take the path on the left with a blue rope to reach the path to the church. We turn left and follow the path round the left of the church. We see a sign for the Holy Well so we take a look then head back to the church. We exit the churchyard and turn left on to the road then immediately take the steps opposite at the far side of the car parking area. At the top of the steps walk forward about 20 feet and take the path on the right marked with a yellow arrow. We follow the path to the top then head straight forward over the stile into National Trust land signposted Church Town Farm. We head uphill following the path between the hedges. Immediately before the road we turn right over the stile sign posted National Trust Tregear Vean into a field to avoid walking on the road and head forwards through the fields to a water tower. We go over the stile to the left of the tower onto the road turning right then left down the track just before the road sign for St Maws. We follow the track and bear right through a gate into a farm then bear left following the track which then bears to the right. We heads forwards through two gates then at the third gate with private on it we turn right over the stile and head downhill with a stream on our right then through an archway of trees with a field on our left. We come out at the Percuil River and turn right and follow the path uphill through the woods. We come out into the open again and head forwards with the river on our left until we come to a boatyard. We turn right uphill and after about 30 feet we turn left and follow the coast path. At the end of the path we turn right uphill then at the top we turn left and walk on the pavement following the road back into St Mawes and the car park. This is an easy walk on paths and tracks over fields with gates and stiles. There is also some road and a few inclines and declines. Elevation: Approx lowest point -1.00m (-3.3ft) approx highest point 81m (266ft). Approx 6.5 miles allow 2½ hours using OS Explorer map 105, Falmouth and Mevagissey. Start point: St Mawes harbour pay and display car park £3.50 for all day. St Mawes is on the southern tip of the Roseland Peninsula on the south coast of Cornwall. From the M5 take the A30 to the far side of Bodmin then the A391 and A390 to St Austell. Continue on the A390 towards Truro taking the A3078 on the left to St Mawes. Parking: St Mawes harbour and main car park off the square both are pay and display also some parking at St Mawes Castle. There are two car parks at St Just in Roseland at the cross free and at the church £2 between 9am – 4pm out of times free. There are public toilets at St Mawes and St Just in Roseland. For refreshments there are a number of shops, cafes, pubs and restaurants in St Mawes. The heart of your writing whilst appearing agreeable initially, did not work perfectly with me after some time. Someplace throughout the sentences you managed to make me a believer unfortunately just for a very short while. I still have got a problem with your leaps in assumptions and one might do well to help fill in all those breaks. If you actually can accomplish that, I could certainly be fascinated. pas la vente de Garcinia Cambogia produits de perte de graisse de qualité réelle ou élevée.